By applying more backlights, display brightness can be increased to 1000 nits or more. The added light overpowers ambient light and make the screen viewable. This can be thought of as a brute-force method. However, adding more backlights always means greater power consumption. On a 7” kiosk display, it can consume ten watts or more. Nearly all of that power goes to heat, requiring much more cooling. And since such displays are made for the industrial market in small quantities, costs are much higher than ordinary LCD displays. Transflective (transmissive-reflective) displays are hybrids. Two different methods for display are used. Under bright illumination the display acts mainly as a reflective display, with the contrast being constant with illuminance. In dim light, the backlight provides needed illumination. With a special semi-reflective filter in the back of the display stack , it can reflect the sunshine outdoor, while the back light can also offer the light penetrating the semi reflective file in the back of the screen. Transflective technology has been widely applied by many rugged tablet manufacturers, like Motion Computing, Panasonic, Getac, and Winmate. Transflective technology is much more expensive than ordinary rugged tablet displays. 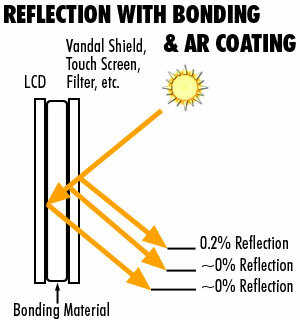 Optical bonding injects a clear, optical-grade resin into the gap between the LCD panel and the protective outer glass, bonding them together. This fills the air gap between the two, eliminating two reflective surfaces. An anti-reflective coating is then applied to the outside of the protective glass, minimizing surface reflections as well. By inserting the resin the amount of internally reflected ambient light can be greatly reduced, increasing the display’s contrast ratio. While significantly improving sunlight readability, optical bonding can also increase the ruggedness of the display and touchpanel assembly. 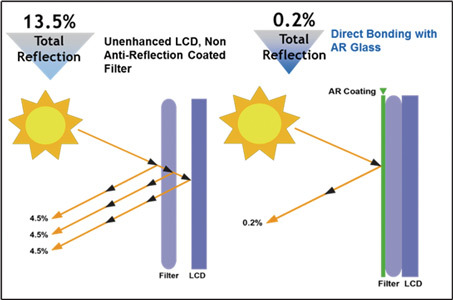 Like transflective LCD technology, optical bonding is quite costly. Glare is caused by a reflection of light on the mirror-smooth surface of the monitor. An anti-glare film is a thin sheet of transparent plastic that is overlaid on a monitor or screen to make reflections more diffuse. Not all anti-glare films are created equal. Some are worthless, while better ones can make a real difference. The best and most expensive films come from Japan. Finally, there is one trick that anyone can use to make any display much more viewable in sunshine – wear a hat with a broad brim, and wear a dark-colored shirt. This minimizes eyestrain from direct sun, and reduces stray reflections on the display. It sounds silly, but it makes a real difference.